I’m not a math guy. I barely passed first-year algebra in ninth grade and—many thanks to the California hippie influence in the 70s—that was the last math class I was required to take. As I remember, I had no problem passing my high school classes, despite almost never having any homework. But that’s another story. Anyway, while I don’t like math, I’ve always found numbers fascinating. If those statements seem contradictory to you, well, they did to me, too. Until I met Norm. In Norm I found a kindred spirit; someone who finds numbers fascinating. But math? Not so much. The other bond I found with Norm is a deep and respectful love of and curiosity about the Bible. 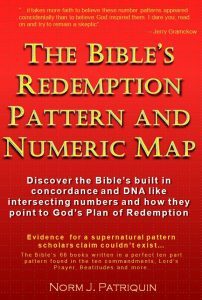 Norm, a computer programmer, has a gift that allows him to see numerical patterns in the Bible, patterns I’ve skimmed right past repeatedly. Norm has, I’ve now come to believe, made some revolutionary discoveries in the Bible. If you’re now thinking, “Good grief, more Bible-code speculations,” well, I have two responses: First, some of the most respected and brilliant men in history have suspected that the Bible is full of number “codes.” Blaise Pascal said, “The Old Testament is a cipher.” By that he meant it has numerical encryptions that, with the proper insight, can be deciphered. Sir Isaac Newton spent more time working on deciphering Bible “codes” than on his noted scientific discoveries. And Dr. Ivan Panin devoted most of his life to painstaking exploration of the numerical structure of the Scriptures. My second response, after defending the legitimacy of Bible code study, is that Norm’s discoveries are not really Bible codes anyway. The patterns Norm has found will not unlock deep, hidden secrets; messages no one has ever seen before in the Bible. They don’t predict future events, but they might shed more insight on passages that refer to future events. Norm’s number discoveries would be meaningless apart from the text in which they appear. What Norm has found are fascinating and insightful patterns. What’s the difference between Bible codes and Bible patterns? The equidistant letter sequence theory (an example of a Bible code) finds obscure messages embedded (hidden) within the Scripture text. For example (in very basic terms), we can find the letters for the word faith spaced equally in the words of this phrase: After Paul picked other theories. This fictional example is very basic, but the theory is similar to some military codes. In 1994, Professor Elyahu Rips, from the Hebrew University, along with Doron Witztum and Yoav Rosenberg, used statistical methods and computers to research the book of Genesis. Using equidistant letter sequence methods, their computers found the names of dozens of Jewish sages who lived between the ninth and eighteenth centuries. According to their study, which was published in the scholarly journal Statistical Science (9:429-438), the probability of such findings is 62,500 to 1 (that’s a .0016 percent probability). Those figures appear to give some credence to the equidistant letter sequence theory—and perhaps they pique your interest. On the other hand, Norm’s number patterns (okay, really they’re God’s number patterns that Norm has discovered) are themes related to numbers. For example, what’s the best known verse in the Bible? (Hint: You’ve probably seen someone at a sports event holding up a shirt or a placard with this verse painted on it.) If you guessed John 3:16 (“For God so loved the world, that He gave His only begotten Son, that whoever believes in Him shall not perish, but have eternal life”), you are correct. This just happens to be the 1,000th chapter of the Bible, and one-thousand is said to be one of God’s numbers of perfection. 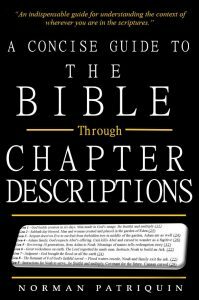 Could the keystone verse of the Bible in the chapter with Jesus teaching on the plan of redemption just happen to be located in the perfectly numbered chapter? Could it all just be coincidence? That was my assumption when Norm and I first talked, and when he first asked me to work with him on this project. But as I saw more and more of these amazing “coincidences” I finally concluded it takes more faith to believe these number patterns appeared coincidentally than to believe God inspired them. I dare you; read on and try to remain a skeptic.